Classes or One to One? 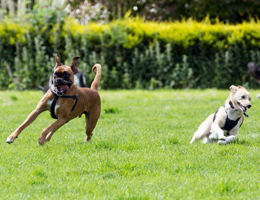 One to ones are just you with your dog, and us and our well trained dogs – usually at our field, our dogs are there on hand to help. We also some times call them “Teaching Dogs” as they can greatly benefit your dog in learning social skills and improving their canine communication in a safe and controlled way. Sometimes a dog might not be ready for class and then our one to ones are perfect! Most adult dogs entering our classes require a behavioural consultation so that we can tailor a program to help them overcome their issues. 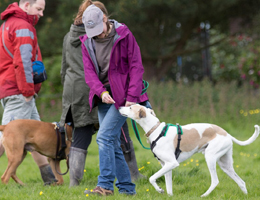 A very popular onlead class for dogs that can be reactive around other dogs and people. Held outside, with small class numbers at our own private venue. 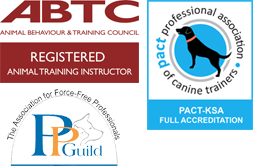 Everyone has plenty of space for this class which enables safe, controlled exposure to other dogs whilst working on self control and having fun. 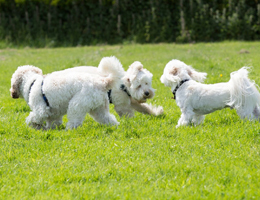 Puppy classes, teaching you and your puppy the skills they will need for life. Socialisation, basic training and lots of fun, in an outdoor natural environment with two highly qualified instructors. 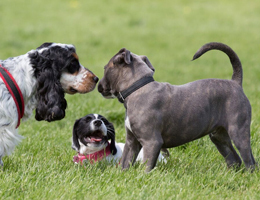 A confidence building class for smaller breed dogs who can be anxious or shy. Overseen by our older, calm and highly-skilled teaching dogs who love helping shy dogs. A fun class for larger breed puppies focussing on recall, offlead skills and calm onlead work around other dogs.